It is a Saturday afternoon in Chicago - September 1st to be exact - and it is supposed to rain any minute. This group of 20 or so are not Occupy protesters though the chant is the same, nor are they members of the Chicago Teachers Union (though there are rumblings of an impending strike already): they are here on this day, at the corner of Kimball and Foster to protest a library - but really they’re pissed off at Laurino who won’t give them the time of day. A good portion of the protesters are over the age of 50, and all seem like active members of the community. One elderly woman named Evelyn has been living in the neighborhood for 80 years: “I went to school here, my kids went to school here.” Despite a nasty fall in the last 24 hours that bruised up her face and the threat of a downpour, Evelyn still made it out to protest because she is “very discouraged” by Laurino’s behavior. 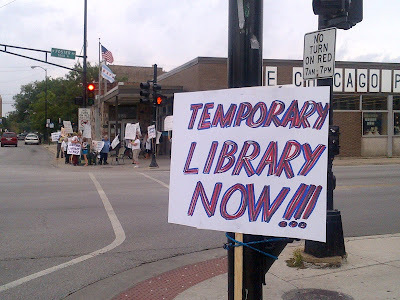 “Two years is too long, temporary library now!” yells a woman into a megaphone. Wait what? 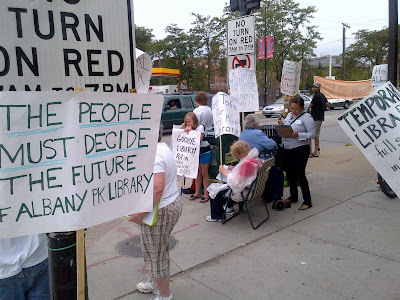 These people have become so riled up over a temporary library, while a new library is being built? How is this a problem for anyone? 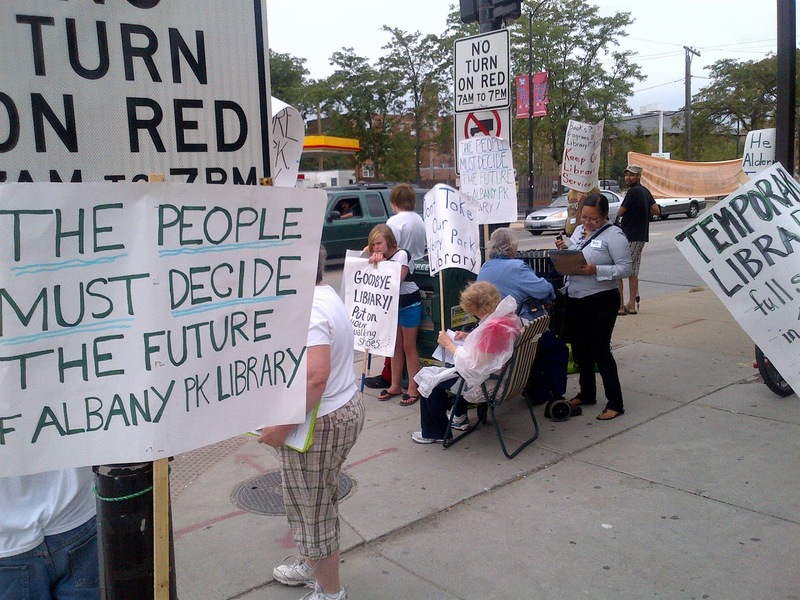 Kathryn Pensack, the organizer of this protest, points out a temporary storefront would much cost less in rent and upkeep costs than if the current library remained open during construction. Pensack started the Committee to Save and Improve the Albany Park Library back in April and says there are about 40 members in the committee and about a hundred active on the mailing list. According to their Facebook page, the group has managed to postpone demolition of the library through “petitioning, phone calls, and grassroots outreach... from July 9 to September,” but they have not been able to meet with Laurino. 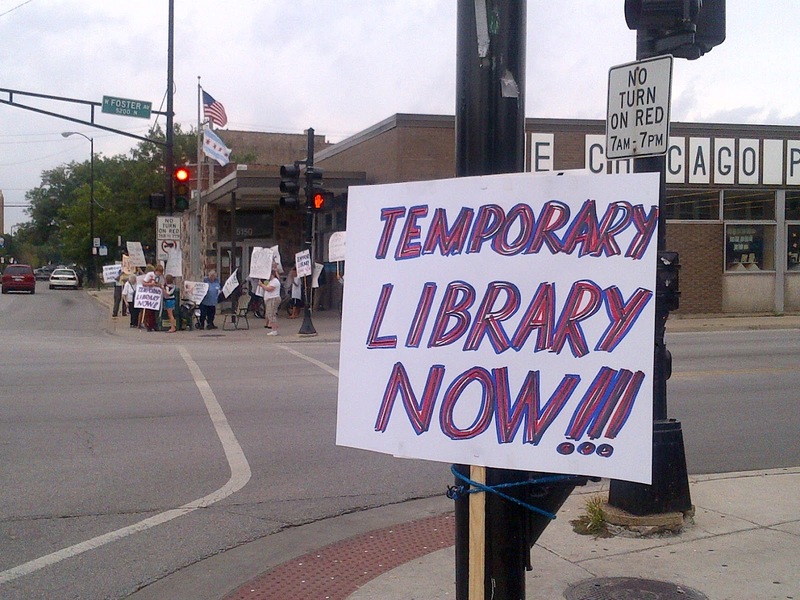 According to the protesters, even Mell thought a temporary library is a good idea, and everyone agreed meeting with him was very easy. Too bad he’s not their alderman (he is mine though!). Why she hasn’t made this clear to her constituents, let alone talked with them in person, is typical Laurino; and I’ve lived here for about 4 years and can comfortably make that statement already. According to protesters, however, her crimes go even further than neglect: Laurino is actively trying to undermine their efforts. 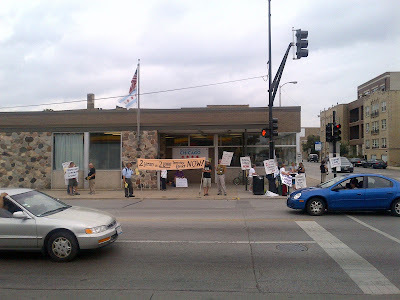 At a recent community event to vote on a plan for the library, something suspicious went down: 40 Middle Eastern or Indian cab drivers showed up. These cab drivers could barely speak English, had never attended any committee or community event regarding the library before, nor were they seen from again. All the cab drivers voted for Laurino’s plan. The protesters on September 1 believe all those cab drivers are employed by the same guy who owns the building being demolished behind the old library. They mutter of a kickback from Laurino. That building, full of affordable housing, is being torn down to make room for the new library. Is Laurino trying to be voted out of office? Only about 10,000 people in the 39th ward voted in the last municipal general elections. “Most of the people who signed the petition didn’t know Laurino was their alderman, and this does not leave a positive impression,” said one protester, who bets come next election time, that’s at least 1000 people who will remember to vote “no” when it comes to Laurino.